Machu Picchu has been built from 1450 to 1540 and it was never completed. 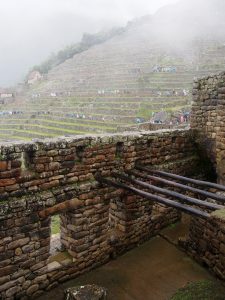 When the Spanish came to Peru, many incas fled here. The incas abandoned the sight in 1540 and luckily never told the Spanish about it. It was only rediscovered in 1911. Due to this, the site was never destroyed and still looks a lot like it did 500 years ago. 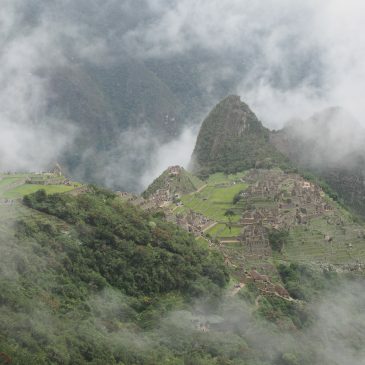 Machu Picchu is the first thing that comes to most people´s mind when thinking about Peru. Whether or how to go there caused us quite a headache since we were in South America. Trekking. The most famous of all treks is the 4-day Inca Trail. When we first thought about Peru, we really wanted to do it. But then, there were two problems: First of all you have to book it months in advance as „only“ 500 people are allowed on the trail per day. Secondly, you have to go with a guide and it costs aproximately $500 per person. Since we wanted to stay flexible on dates and also didn´t want to spent $1.000 in four days, we decided to skip it. 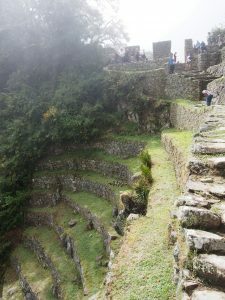 There are many other treks to Machu Picchu. 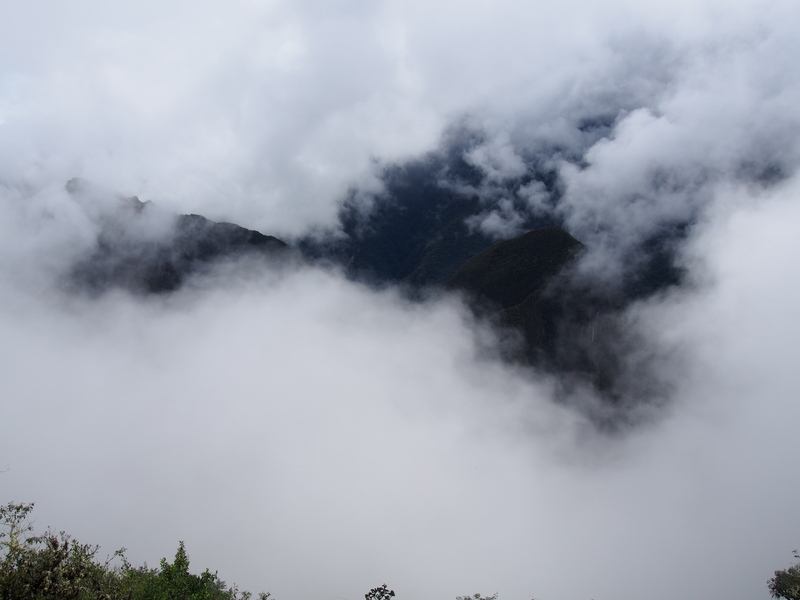 Lares and Salkantay Trek are famous and Salkantay is also affordable. 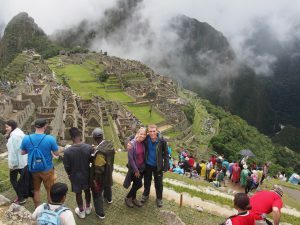 We thought about it a lot, but in the end we decided there are nicer treks in Peru. 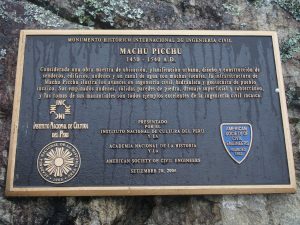 If we can´t do the Inca Trail, we don´t have to hike to Machu Picchu. Train & Bus. 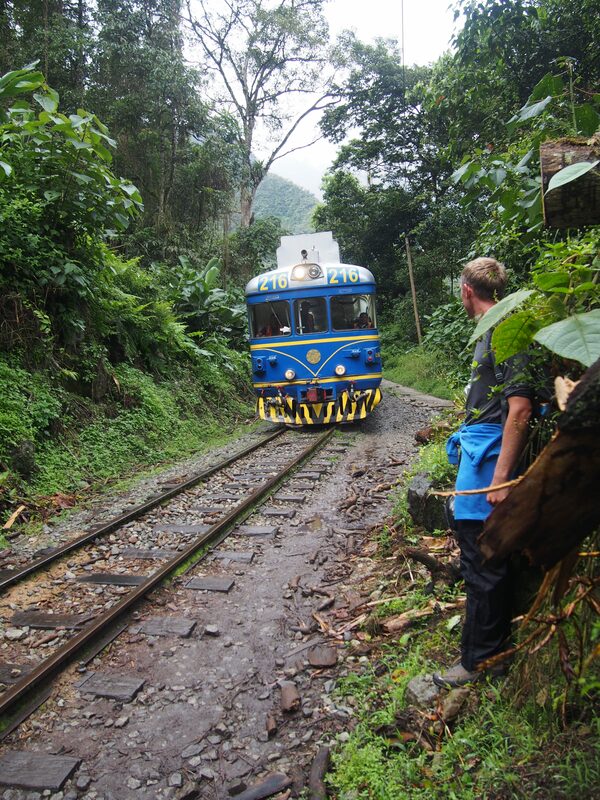 There is a train from Cusco to Aguas Calientes, the village right below Machu Picchu. From here you can take a bus for another 15 minutes to the entrance. The cost for the train is at least $120 and the bus another $24 for the round trip. We think this is ridiculous. If you wonder why all prices are in dollar – there are so many gringos here that everything is in dollar! Bus & Hike. Luckily there is now a third option. You can take a 6-hour bus from Cusco to Hidroelectrica (14€ round trip), from where you have to hike for 2.5 hours along the railway to Aguas Calientes. From there you can also hike up a steep staircase to the entrance of Machu Picchu. Which option do you think we went for? Of course it was number 3 😉 So we were picked up early one day for one of the worst bus rides ever. After curvy four hours on a paved road we discovered that the real death road is actually in Peru 😉 Unpaved, narrow and with a cliff on the side that would definitely kill you. 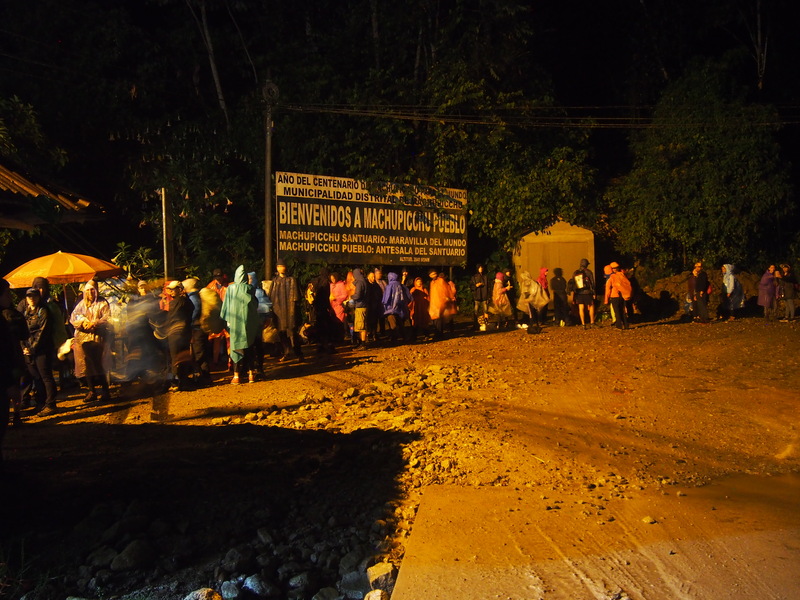 After another 2 hours on this road we finally arrived in Hidroelectrica. There is a train station, so if you are lazy or tired you can take the train from here to Aguas Calientes for just $12. But of course we didn´t do that. Hiking along the railway isn´t too hard because it doesn´t go up and down, and it feels kind of adventurous. Nowadays there are many people hiking here, so it also feels quite crowded. There is enough space to hide from the train. But there aren´t too many trains coming anyway. You just shouldn´t miss the spot where you have to leave the railway. We missed it and had to walk through two tunnels, which really feels quite scary. 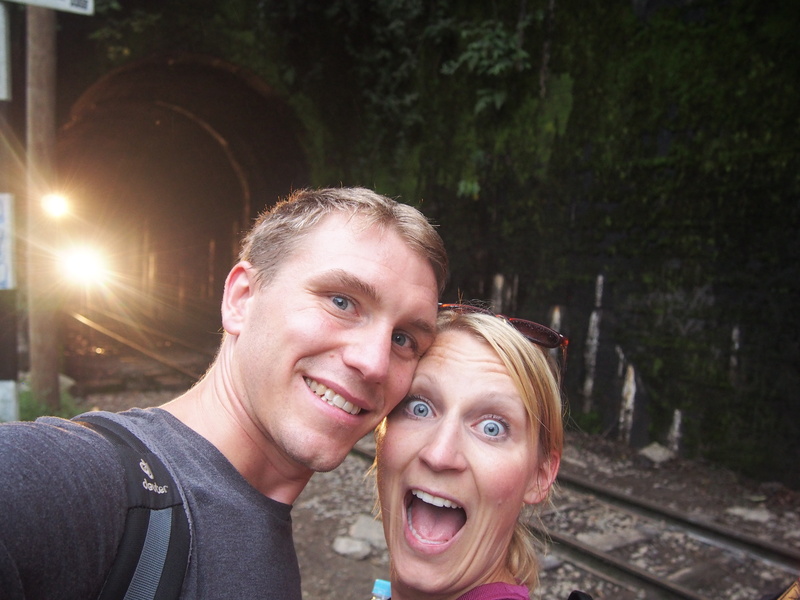 A train arrived just one minute after we left the second tunnel! Walking up to Machu Picchu takes about 1.5 hours. We left the hotel at 4 in the morning in the rain an walked to the bridge for about 20 minutes. Here we had to wait until 5 for the doors to open. That was a bit annoying because we were almost the first people there. By 5 there was a long line. So now everyone went up the staircase in a long line at the same time. To make it until 6 am when the gates open you have to hurry! 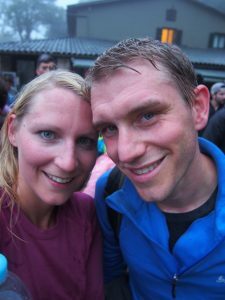 It was an exhausting 400m ascend, but we made it in 50 minutes, just to get in line again for Machu Picchu. We were surprised to see that many people there already! But getting there so early is worth it. The real crowds arrive later and in the morning you have many spots to yourself. Unfortunately it hadn´t stopped raining. 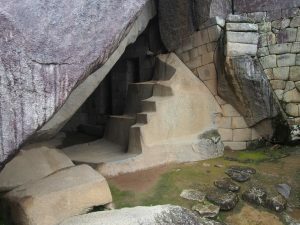 We first made our way to the main viewpoint (The Hut of the Caretaker of the Funerary Rock, take the first staircase on the left when you enter the site). We were almost alone there, but we couldn´t see anything. 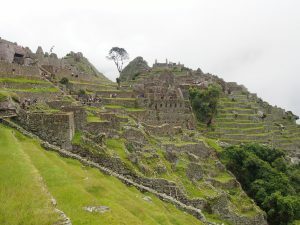 You can purchase different tickets to Machu Picchu. The cheapest one is for the city only. Then, there are two mountains you can climb. 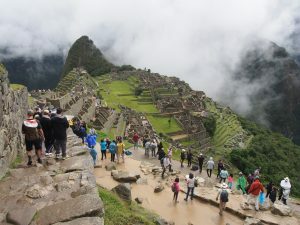 The more famous one is Huayna Picchu, but tickets are sold out weeks or months in advance (400 people per day). 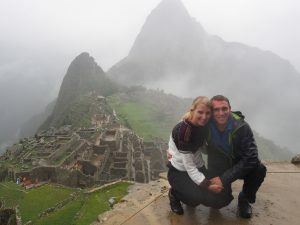 We bought our tickets one day in advance, so we were lucky to get tickets for Machu Picchu Mountain. 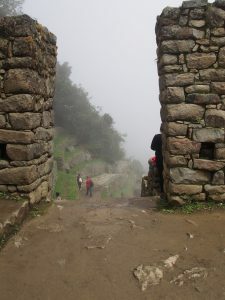 This mountain is supposed to have great views of the Inca Trail as well as the city itself. It is just another 680 meter ascend. We had booked for the 7am group, so we went up right away. After the run up to the entrance it got really exhausting. The views didn´t get better and it also didn´t stop raining. After one hour we turned around. That was the first time ever we turned around before arriving at our destination on this trip, but it just wasn´t worth the effort with only clouds in sight. When we were back down we walked to the sungate. 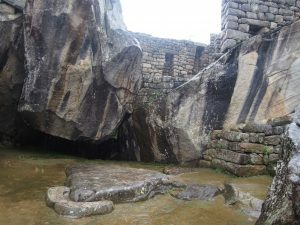 It is another 30-40 minute walk from the main sight of Machu Picchu. 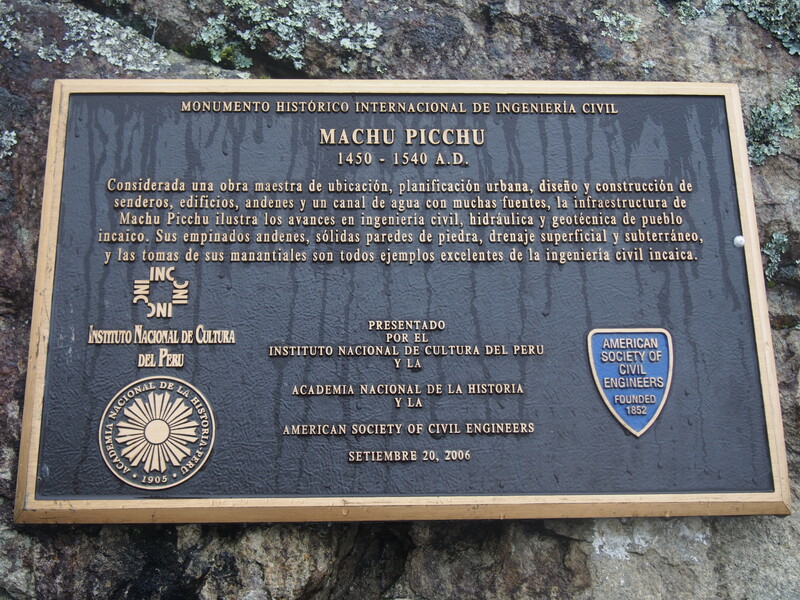 It is the spot were the Inca Trail ends and the exhausted hikers see the site from far for the first time. We could only imagine what it must feel like. 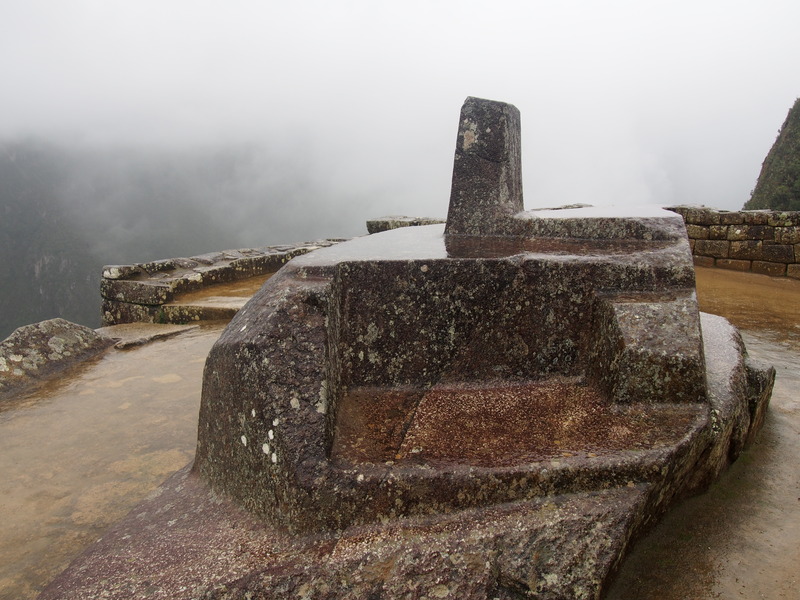 We could also only imagine Machu Picchu from here, because it was still clouded. It was almost 11 am now and we got disappointed. On our way back to the main sight the clouds finally opened up a little and we saw it! The clouds gave the whole site a kind of mystical touch and it was beautiful. When we made it back to the main viewpoint we were shocked – no more mystical touch here, it was totally overcrowded, as you can see on our pictures. It would have been great to see this view in the morning when we were alone, but you can´t change the wheather. 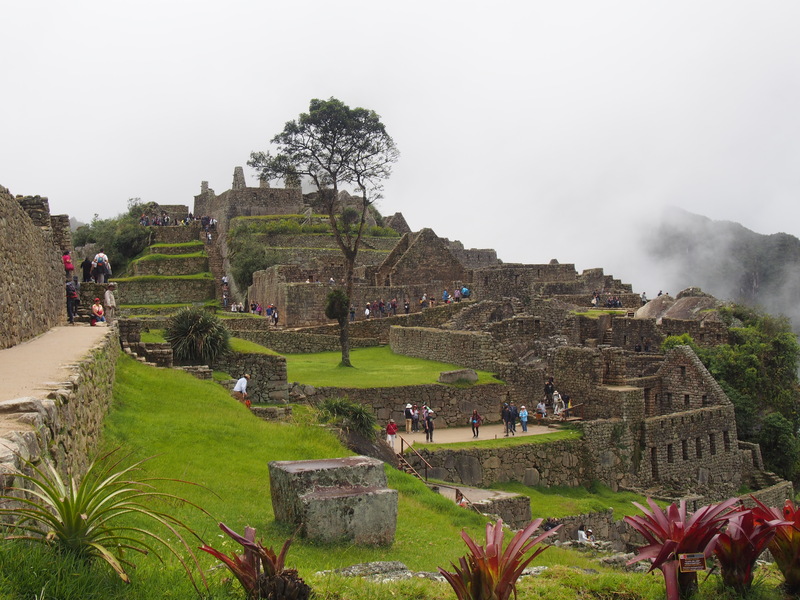 The incas definitely were experts in finding spectacular locations. 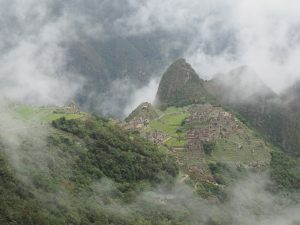 Machu Picchu and Huayna Picchu with all the mountains around and overlooking the valley is beautiful. We knew it would be crowded until 3pm, so we decided to leave for a minute to find a guide. You are allowed to enter the site three times a day. Toilets are outside. If you know Sandra, you know that this is torture for her! It is very regulated here, e.g. at some points you are not allowed to turn back so you have to leave and re-enter again. We wanted a guide to understand more about the site and the incas, and it was definitely worth it. With the guide, we entered the main city for the first time of the day. 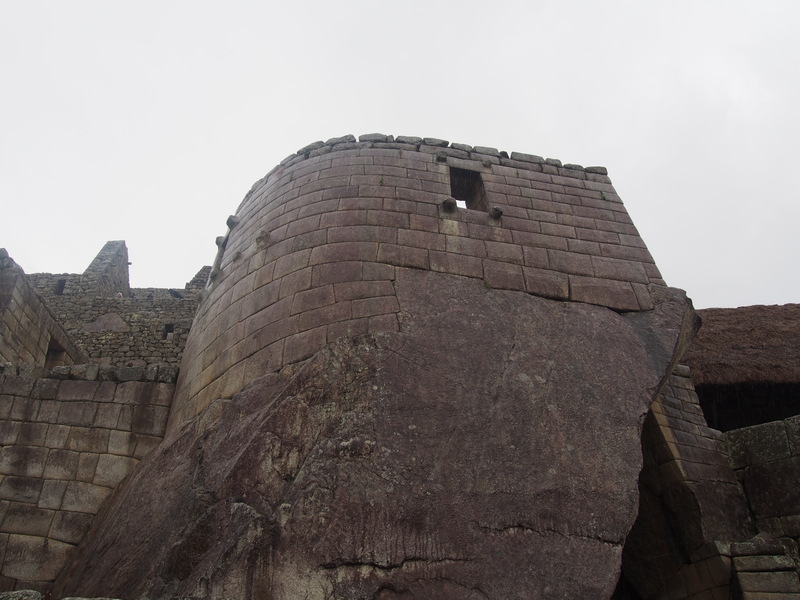 The incas were incredible architects and engineers. They had built perfect drainage systems, and we saw the proof of that today in the rain. Our guide said that it was one of the reasons why the city was still as preserved. This is supposed to be a condor. You can see the head at the bottom drinking water. The walls in the back are its wings. Of course, we had to walk back to Hidrelectrica the next day (avoiding the tunnels this time) and arrived back to Cusco late at night. So including a guide, we paid 110€ for the three days (without food) and this is definitely the cheapest and most exhausting way to do it. But at least we felt like we deserved Machu Picchu after all this effort. Our thoughts on Machu Picchu: It is definitely a fascinating site and we understand why it is so popular. But it was so controlled and overcrowded that it felt a bit like Disneyland, especially at certain times of the day. 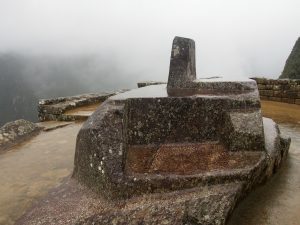 Before we got here, we had seriously considered skipping it and going to a less explored sight like Choquequirao, visited by only 100 people per day. That is because it is a four day hike to get there and back. We believe that 70% of the visitors to Machu Picchu wouldn´t make it if they had to walk only the one hour staircase. We hope that the country will be able to preserve the sight and its magical atmosphere despite the crowds visiting every day. 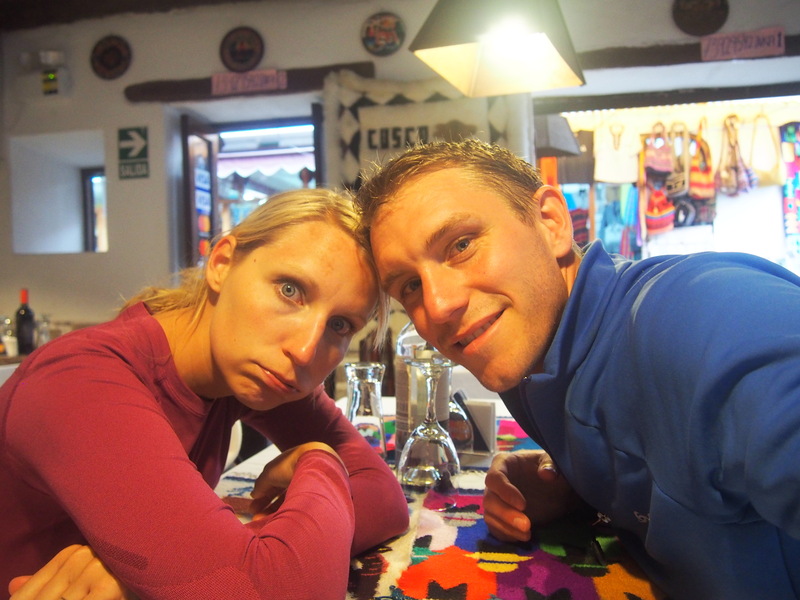 In the end we didn´t go to Choquequirao because the trek was also quite expensive (and we don´t want to be in high altitudes anymore, we are freezing!). But it is still on our list and we are curious to find out if it is a real alternative to its famous brother.